Formulas and examples for converting each type. Chart comparing each type's benchmarks. Tap the desired conversion option. The temperature conversion calculator will then rename the fields according to your selection. Note that Celsius is also referred to as Centigrade, so Centigrade to Fahrenheit conversion is the same as Celsius to Fahrenheit. Enter the temperature units/degrees to convert from the type listed on in this line. This is the temperature converted to the type listed on this line. To create a custom temperature conversion chart that you can print out, enter the starting and ending temperature of the type you are converting from (selection at top of calculator). Then click the Create Conversion Chart button. Enter the temperature you want the chart to start at. Enter the temperature you want the chart to stop at. 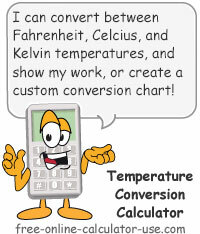 This calculator will convert Celsius to Fahrenheit, Fahrenheit to Kelvin, Kelvin to Celsius, as well as the reverse of all three conversions. Plus, unlike other online temperature converters, this one will show the formula and step-by-step math it used to complete the conversion. Finally, the calculator also provides a feature that will allow you to create your own custom, printable, temperature conversion chart. Just select the scale you are converting from and to, enter the desired starting and ending temperatures, and click the button. Cool! Select the type of conversion you would like to have calculated. Enter the temperature you would like to convert. Or, if you want to create a printable conversion chart, skip to the bottom of the calculator and enter the starting and ending temperatures, then click the "Create Conversion Chart" button. Click the "Convert Temperature" button. This will display the result of the conversion and generate a step-by-step explanation showing how the calculator arrived at the result. Temperature scale wherein 0° C is the freezing point, 100° C is the boiling point, and average room temperature is 20° C. The Celsius scale is used primarily outside the U.S. Temperature scale wherein 32° F is the freezing point, 212° F is the boiling point, and average room temperature is 68° F. The Fahrenheit scale is primarily used in the U.S.
Absolute temperature scale wherein 273 Kelvin is the freezing point, 373 Kelvin is the boiling point, and average room temperature is 293 Kelvin. The Kelvin scale is based on absolute zero (-273.15° C) -- which also means the Kelvin scale has no negative units (does not use the term degrees). How to convert temperatures from one type to another. Each of the following examples lists the temperature conversion formula for the corresponding type, plus solves for the unknown variable. C = 15° , F = ? I hope I've explained the conversion process well enough for you follow the steps. If not, please let me know on the feedback form located beneath the calculator.